Georgina Groves is Projects Director at Wild Welfare and has over 15 years of experience working for animal welfare, research and conservation organisations including the British and Irish Association of Zoos and Aquariums and The Natural History Museum in London. 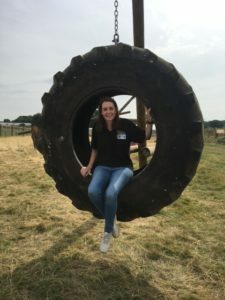 Georgina is responsible for overseeing the charity’s global projects and ensuring the organisation stays true to its vision of ending the suffering of captive wild animals around the world. In our exclusive interview, Georgina discusses the work of Wild Welfare across the globe – with details of some amazing projects – and shares her hopes for the future of animals in captivity and what we can do to help. For those not familiar with Wild Welfare, could you tell us a bit about how you operate and how you came to join the charity? Wild Welfare is the first project-led captive wild animal welfare initiative that’s solely focused on improving welfare standards by uniting leading zoos and animal welfare NGO’s around the world. Dr David Jones (Past Director of London Zoo, UK and North Carolina Zoo, USA) established Wild Welfare in 2012 and we registered as a UK charity in 2016, however we have rapidly established ourselves as an internationally recognised hub for zoo animal welfare reform. No one really knows the number of captive wild animal facilities around the world, but there has been an estimate of 7,000 up to 16,000! While a small percentage of these fall under effective protective legislation and guiding principles laid out by a membership zoo association, a significant number of facilities still fall outside the ethical oversight of an association body or are not influenced by effective national or international legislation. The result is poor animal management practices that impact on the welfare of potentially thousands of animals. Wild Welfare aims to facilitate positive dialogue between leading zoos and animal welfare NGOs so we can identify shared objectives and come together to help solve some of the challenging issues found within captive wild animal care. We will always challenge practices that compromise animal welfare, but our approach is positive, collaborative and knowledge-led. Back in 2006/7, I had worked with Dr Jones on the issue of Japanese bear parks, in my previous role as an animal welfare campaigner at the charity, World Animal Protection, and I met our Field Director, Dave Morgan, during my time as Zoo Biologist for the British and Irish Association of Zoos and Aquariums. Having worked for “both” sides, I knew that both the zoo and animal welfare community had a shared objective – to ensure that while animals are in captivity, they have the opportunity to thrive – however what wasn’t agreed upon always, was how this was achieved. I really identified with what Wild Welfare was trying to achieve by bringing together shared experiences, resources and objectives, so when given the opportunity to get involved, I jumped at it! You work with zoos across the globe to improve the welfare of captive animals, but how do you decide which ones to work with and what is your approach? Ideally, we’d be working with the facilities that have animals in need of critical help. However, that isn’t always possible or even the most effective approach for long-term change. Unfortunately, these situations are often found in regions that are politically unstable or even unsafe and a lot of money and time can be ploughed into trying to make change happen when it just isn’t going to happen at that particular time. We currently have four considerations when deciding which zoos to work with; 1) how acute or chronic is the perceived animal welfare concern? 2) Is there willingness to change from the facility’s staff? 3) Is there willingness to participate in change from the key relevant people, such as the owners, government officials or even the public? and finally, 4) Can working with this facility help support other animals in the region? For example, could the staff influence change in other facilities by sharing their knowledge in national workshops or through the zoo association, helping install regional and longer-term change? Your education programmes and workshops help improve standards for animals worldwide, but how do you ensure this work is ongoing? Often, before we work with a facility, we will carry out an extensive assessment of the whole collection, looking into all aspects of management that can impact the animal’s welfare. From enclosure design and quarantine care to staff health and safety protocols, we’ll consider whether the issues are infrastructural, staffing or resource-led and this can help us identify the most effective recommendations for improvement. Often the animal welfare concern is obvious, but the reason behind why it exists is more nuanced. By providing an extensive assessment we can build up a rapport with the facility staff and work with them to find the solutions. We also firmly believe that long-term change only happens if you can change the attitude of those that can make a difference to the well-being of the animals. There must be an interest and willingness to make improvements that continue long after someone participates in a workshop or education programme. And it also means that we must work with all the key people and groups who can make a difference. For example, we may provide training on environmental and behavioural enrichment for the keepers who can make day to day changes, work with senior management to develop institutional welfare policies and also work with regional authorities who can influence longer term legislative change or provide an ethical and welfare oversight through the development of a regional zoo association. I strongly believe there is no one way to provide training or support, but key to any approach is ensuring that those you are supporting, have a hand in their own destiny. They should be involved and engaged in the process from the start. It’s also amazing what we can learn from each other when we open up dialogue and develop a training programme that encourages a two-way conversation. Our attitude to keeping animals in captivity has changed in recent years with many campaigning for better treatment. Do you think there is a reason for this shift and is this something you see globally? Over the last twenty years, there have been many positive advances in all the sciences relevant to animal welfare. And we have seen zoo animal welfare spring to the fore as a major topic in progressive zoo animal science. However, this has also exposed those facilities that are not attaining high standards of care. Equally, societal and zoo community interest in the welfare of animals in zoos is at an all-time high, and in this modern media world, more than ever, zoos are under the spotlight when it comes to their animal care. Through the growth of social media’s capability to almost instantaneously share information while also providing a voice for millions around the world, there is a loud, tangible and growing public interest in the welfare of animals being held in zoos and aquariums. Knowledge in animal welfare by the public varies and misinterpretation of certain issues or practices going on in zoos can occur. I’ve seen people complain about a “sad and bored” lion, when actually that animal is just taking time out, digesting its food and doing what it would naturally do in the wild! So, animal welfare concerns can be raised when there are none, however equally, many other very real concerns can go unnoticed. As our knowledge of animal sentience and an animal’s capacity to suffer continues to develop, there is a growing movement towards challenging practices like performing animal shows or holding animals in barren, unstimulating enclosures. Finally, many people don’t differentiate between one zoo and another. The result is that when cases of poor welfare are reported in the media, all zoos, good and bad, are impacted in terms of public opinion. The resulting political aftermath can actually hinder progress and impede efforts to tackle the real welfare issues, while also misinforming the public on animal welfare. It’s important that zoos continue to communicate to the public both the good and the bad that goes with managing wild animals in captivity. For example, some zoos can be naturally risk averse to publicly announcing an animal death or other issue that might be perceived as a concern, however honesty and transparency can go a long way to gaining the public’s trust while simultaneously educating them on the reality of running a zoo. Since working with Wild Welfare, what has been your most memorable experience and do you have a story you are particularly proud of and would like to share? Rehoming four bears from Japan to the UK was an amazing project to be part of and one I am particularly proud of. 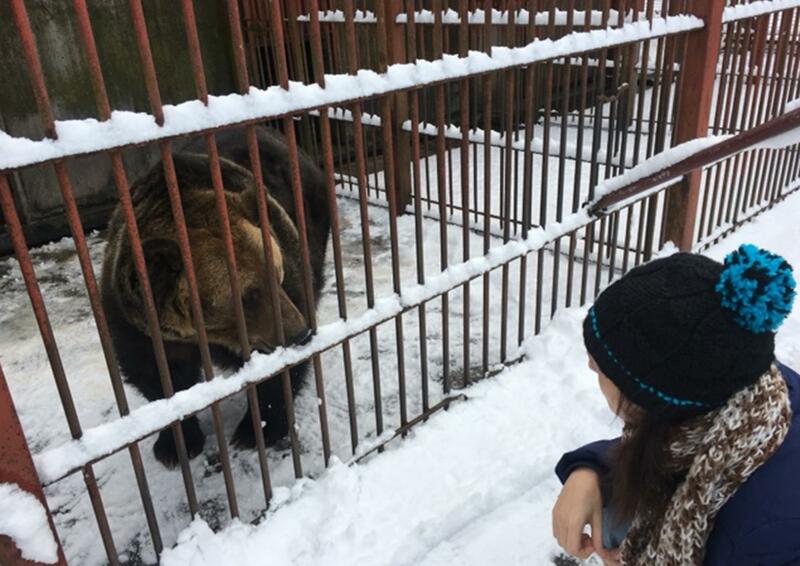 I was first made aware of the bear’s plight by my colleagues at the Japan Animal Welfare Society (JAWS), Tokyo, who had been to visit the bears held at a Museum in Hokkaido to offer advice. These four bears were kept in cramped, concrete cages and over the next 18 months I visited the bears (Hanako, Riku, Kai and Amu) a number of times with JAWS colleagues as well as members from the Japan zoo community. The Museum were willing to give up the bears and we desperately wanted to find them a better home in Japan but at the time this just wasn’t an option. Through previous partnerships with Yorkshire Wildlife Park in the UK I contacted their CEO, John Minion, and asked him whether he’d consider taking the bears. Hats off to him for barely missing a beat before responding that yes, he’d certainly consider it – and well, that was that! Six months later, with enormous support from the Yorkshire team and a number of bear, welfare and zoo experts from Japan, a small team of us went out to Japan (during the summer heatwave over there!) to bring the bears home. 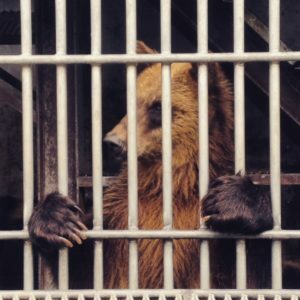 During that week, we planned meticulously how we were going to get four huge brown bears out of their small cages safely, then journey them on to Hokkaido airport, Tokyo airport and then on to London Heathrow. A particular memory for me was, after about 24 hours of being awake, slightly deliriously feeding Hanako grapes in a Japanese airport cargo area as we waited for a connecting flight! Finding homes for the bears was a huge task and our focus as a charity is not actually centred on rescuing or rehoming animals. However, our remit of developing positive collaborative partnerships to improve animal welfare is a focus and we worked with no fewer than 10 organisations from around the world to make this project happen. It has also opened up possibilities for us to help the hundreds of other captive bears in Japan living in bear parks, simultaneously gaining a better understanding of Japanese culture and the different way things are done across the country, so we can improve conditions for these other bears. We believe our approach of uniting key organisations and communities who can make a real difference to animals’ lives in Japan, can secure better animal welfare standards for all Japan’s captive wild animals. The project has demonstrated a future where the world’s leading zoos demonstrate to others what compassionate care and welfare looks like and how best to achieve it. Wild Welfare’s work extends to zoos and animals around the world. Could you tell us about your current project and who you are working with? It would be a lengthy response if I listed all the projects and partners we are currently involved with! One of my main projects for Wild Welfare at the moment is based in Japan. I’m extremely fortunate to have built up a network of highly skilled international and national zoo and animal welfare experts in the UK and Japan, who I’m also lucky enough to call my friends! I am working with key colleagues from the Japanese animal welfare community and zoo community, all of whom have extensive experience in Japanese animal welfare issues. There are hundreds of captive wild animal facilities in Japan, ranging from bear parks, aquariums to shopping mall zoos. The demand isn’t decreasing and the number of captive facilities is most likely on the increase. Japan has come under a lot of international criticism on animal welfare, namely in regard to the whaling industry, the Taiji dolphin hunts and the bear parks, and more recently there is a growing animal welfare movement within the country, adding pressure for captive wild animal facilities to be held accountable. At the same time, animal welfare legislation in Japan is complex so ensuring good care and welfare for captive wild animals in the country is a challenge. My colleagues advise me on Japanese conduct (which is very important) and we’re working together on making individual zoo improvements, working towards legislation change and coordinating on specific individual animal cases. We have ongoing projects with some of the country’s bear parks to help improve care for captive bears and we’re carrying out regular training workshops with zoo staff, veterinarians and animal welfare organisations across the country. 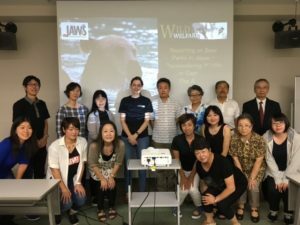 Japan remains extremely sensitive to criticism, but I am fortunate to have built up good partnerships with key people and this has and continues to open doors for Wild Welfare’s work in Japan. As well as our work in Japan, we have ongoing projects in Brazil, Vietnam, Thailand, potential upcoming projects in three other countries and we’re also working on a series of animal welfare resources. There are many facilities that need advice and practical support and many animals that can benefit from our help, so while that is the case, our range of projects will continue to grow. What would be your hope for the future of animals in captivity and what can we do to help? My hope is that all animals in captivity are treated with the respect they deserve. It’s proven that many species have a sentient capacity, and can feel a range of complex emotions. This emotional capacity is an evolved process acting as a form of survival. Emotions are motivators, designed to move you along a certain course of action that will ideally be rewarded with further positive feelings – supporting growth and survival, while avoiding negative feelings that could be detrimental to both health and ultimately their survival. So, it is not that hard to rationalise why sentience is commonplace through the animal kingdoms. All species are of course different, and we cannot assume that an elephant has the same responses to a stimulus as a human, however we can acknowledge that all species have the capacity to both suffer and feel positive feelings in a manner that we can relate to. Respecting an animal’s capacity to feel gives us a starting point as to how we interact with them and what we should ask from them. Making animals perform for our entertainment is not just ethically dubious, but also means that we are often forcing them to make choices that may be uncomfortable and unnatural for them. Holding animals in sub-standard environments is unacceptable with the knowledge that we now have, and with that knowledge also comes responsibility to challenge historically held zoo practices– for example should we still hold species in climatic environments that are wholly unsuitable to them? The public can help by changing their thinking and behaviours too. Being close to wildlife has become almost too accessible in this selfie-age, people see an animal and want to hug it, feed it, and take their Instagram picture with it. But they’ve got to understand how that experience can potentially negatively impact the animal during the encounter, and also how the animal got to be in such a position in the first place and how this unnatural interaction will affect its long-term welfare. Wild Welfare is developing a whole series of exciting public awareness tools that we hope to launch in 2019, and these will be aimed at educating the public on good animal welfare, how to spot the signs a captive animal might be suffering and what they can do to help. Education and empathy is everything and if we can ensure people understand how animals think, feel and experience, then we can hopefully eradicate animal suffering and bring in the age of compassion.